The 24 Caprices for Solo Violin were written in groups (six, six and twelve) by Niccolò Paganini between 1802 and 1817. 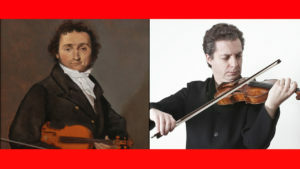 As we all know they demand a lot of technique, velocity, accuracy and precision from the violinist. No wonder these Caprices are both loved and hated by the majority of the players! The series is a real challenge to master. Not only for students but also for professionals and teachers. Master Teacher Pavel Berman, a student himself of the legendary Isaac Stern and Dorothy Delay, took up the challenge to record all 24 Caprices on video for iClassical Academy. An exceptional series came out. A set of 24 high-level instructional lessons, completed with each performance, we dare to say to have exclusive material online available! During the inaugural StradFest of March 24th, 2019, Irma de Jong, our executive director spoke to Pavel Berman about this challenge and his deviate approach of mastering the Caprices. Of course, even with his sage advice, it still requires a lot of dedication from the student, the name Caprice has not fallen from the sky for anything! "I started to play the violin at 4 years old. Especially in a performance, you have to be able to play each one of them. How do I prepare? I balance my energy. When I was younger it was maybe easier. But the first thing is to know every element, not only the technical element but also your mental and emotional state. You sort of make a map in your mind of the cycle. Where you have to be especially concentrated, where you can risk, not to risk, be calmer, the structure, which is very personal for each violinist. You have to anticipate, think of the next when still playing the one before. It is more balanced to perform them when you’re older, I feel calmer about it now. Some experiences come with age. You just have to walk the way." Question: How do you practise? "It depends on the state of the preparation. First, you must be ready to play them all. Then you perform them in groups. The main difficulty is to construct a circle and be able to play them through. Then I know exactly my “difficult” moments. To understand all of this you must be able playing them all. It’s a big challenge." In Berman’s view, it is useful to practice them in groups. It helps you to bring your violinistic level up! Much more in the video.